The Zapotec  languages are a group of closely related indigenous Mesoamerican languages that constitute a main branch of the Oto-Manguean language family and which is spoken by the Zapotec people from the southwestern-central highlands of Mexico. Present-day native speakers are estimated to number over half a million, with the majority inhabiting the state of Oaxaca. 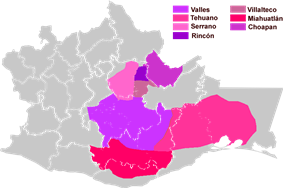 Zapotec-speaking communities are also found in the neighboring states of Puebla, Veracruz, and Guerrero. Labor migration has also brought a number of native Zapotec-speakers to the United States, particularly in California and Bridgeton, New Jersey. Most Zapotec speaking communities are highly bilingual in Spanish. The name of the language in Zapotec itself varies according to the geographical variant. In Juchitán (Isthmus) it is Diidxazá [didʒaˈza], in Mitla it is Didxsaj [didʒˈsaʰ], in Zoogocho it is Diža'xon [diʒaʔˈʐon], and in Santa Catarina Quioquitani it is Tiits Së [tiˀts sæ], for example. The first part of these expressions has the meaning 'word' (perhaps slightly reduced as appropriate for part of a compound). Zapotec and the related language Chatino together form the Zapotecan subgroup of the Oto-Manguean language family. Zapotec languages (along with all Oto-Manguean languages) form part of the Mesoamerican Linguistic Area, an area of linguistic convergence developed throughout millennia of interaction between the peoples of Mesoamerica. As a result, languages have acquired characteristics from genetically unrelated languages of the area. Although commonly described as a language, Zapotec is a fairly extensive, if close-knit, language family. The time depth is comparable to that of the Romance languages. Dialectal divergence between Zapotec-speaking communities is extensive and complicated. Many varieties of Zapotec are mutually unintelligible with one other. There are some radical jumps in intelligibility between geographically close communities, so the varieties do not form a dialect continuum in a strict sense, though neither are there clear-cut divisions between groups of varieties. As a result, the Mexican government officially recognizes sixty Zapotec languages. Zapotec languages fall into four broad geographic divisions: Zapoteco de la Sierra Norte (Northern Zapotec), Valley Zapotec, Zapoteco de la Sierra Sur (Southern Zapotec), and Isthmus Zapotec. Northern Zapotec languages are spoken in the mountainous region of Oaxaca, in the Northern Sierra Madre mountain ranges; Southern Zapotec languages and are spoken in the mountainous region of Oaxaca, in the Southern Sierra Madre mountain ranges; Valley Zapotec languages are spoken in the Valley of Oaxaca, and Isthmus Zapotec languages are spoken in the Isthmus of Tehuantepec. However, Valley Zapotec and Isthmus Zapotec group together (as Central Zapotec), and this ignores the minor Western Zapotec varieties. Certain characteristics serve to classify Zapotec varieties in ways that cross-cut the geographical divisions. One of these is the distinction between disyllabic roots and monosyllabic roots. It is clear that proto-Zapotec had disyllabic roots; the vowel of the second syllable could be any one of the inventory of vowels. One innovation shared by many varieties of Zapotec is the loss (or partial loss) of the vowel of the second syllable. The word for 'water' illustrates this fact. In conservative varieties, the vowel of the second syllable is retained: /nisa/ in Isthmus Zapotec and /inda/ in Sierra de Juárez Zapotec, for example. In innovative varieties, the vowel of the second syllable was lost: /nis/ in Amatlán Zapotec and Mitla Zapotec, for example. The loss of the vowel /i/ often resulted in palatalized consonants, and the loss of /u/ often resulted in labialized consonants. Compare the words for 'dog' in conservative varieties (Isthmus /beʔkuʔ/, Sierra de Juárez /bekuʔ/) and innovative varieties (Amatlán /mbak/ and Mitla /bæʔkʷ/). In this particular word Amatlán does not have a labialized consonant at the end, and the otherwise innovative variety Yatzachi keeps the final vowel: /bekoʔ/. Another characteristic that classifies Zapotec varieties is the existence or not of a contrast between alveopalatal fricatives and retroflex fricatives. Innovative varieties have introduced the contrast while conservative varieties have not. Two of the moribund varieties, Asunción Mixtepec and San Bartolo Yautepec (ISO "Yautepec"), are apparently divergent. Santa Catarina Albarradas Zapotec was not listed, and presumably subsumed under Albarradas Zapotec, but intelligibility is one-way. In Zapotec languages, fortis typically corresponds to voicelessness and extra length in obstruents and extra length in sonorants. Lenis corresponds to voicing and less length in obstruents and less length in sonorants. In addition, stressed vowels before lenis consonants may be longer than those before fortis consonants. Some varieties of Zapotec have a contrast between alveopalatal fricatives and retroflex fricatives. In other varieties this distinction has been lost in favor of only one or the other. Zapotec languages are tonal, as are Otomanguean languages generally. They differ in the number of contrasting tones they have. 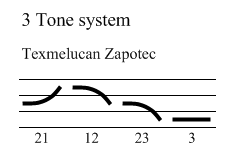 One example is Texmelucan Zapotec, which has four contrasting tones: three contour tones and one level tone, as shown in the figure. These tones are used for "word play" frequently. Zapotec languages all display contrastive phonation type differences in vowels. Minimally they have simple vowels vs. some kind of laryngealization or creakiness; see Quioquitani Zapotec, for example. Others have a contrast between simple, laryngealized and "checked" vowels (which sound like they end in a glottal stop); see Isthmus Zapotec, for example. Others have a contrast between those types and also breathy vowels. The latter varieties include Mitla Zapotec and San Lucas Quiaviní Zapotec. Varieties that are described as having stress, including Isthmus Zapotec, have it on the penultimate syllable of the root. Prefixes and clitics do not affect it. Many varieties overwhelmingly have monosyllabic roots and stress falls on that syllable. Zapotec languages vary considerably. Some characteristics of Zapotec grammar common to the language family (though not necessarily present in all members) are: an extensive 3rd person pronoun system based on noun classes such as divinity, babies, animals, objects (inanimate), etc. ; a distinction in the first person plural ("we") as to inclusive (including the hearer[s]) and exclusive (not including the hearer[s]); a frequent underspecificity of singular/plural distinctions. Laad ʂ-unaa Dolf d͡ʒe z-u nga. The noun also precedes a modifying phrase that is another way to indicate possessor with nouns that are not inherently possessed. The preceding example also illustrate that Zapotec languages have prepositional phrases as expected for head-initial languages. Quantifiers, including numbers and the word for 'one' used as an indefinite article, precede the noun. Demonstratives, including one that means Aforementioned (in some varieties) and is sometimes translated as a definite article, occur phrase-finally (although they are sometimes written as if they were suffixes). Descriptive adjectives follow the noun. When they occur they also typically receive the primary stress of the phrase, causing the noun to lose some phonation features. Note the loss of the breathy feature on the word /beʰnː/ in the following example. Zapotec languages also show the phenomenon known as pied-piping with inversion, which may change the head-initial order of phrases such as NP, PP, and QP. A few varieties of Zapotec have passive morphology. This is a prefix on the verb. Compare Texmelucan Zapotec root /o/ 'eat' and its passive stem /dug-o/ 'be eaten', with the prefix /dug-/. In many other cases, the transitive-intransitive verb pairs are appropriately described as causative vs. noncausative verb pairs and not as transitive-passive pairs. Setting aside possible abstract analyses of these facts (which posit an underlying prefix /k-/ that causes the changes seen superficially, we can illustrate the kinds of non-causative vs. causative pairs with the following examples. (Basic intransitive verbs are more common than basic transitive verbs, as in many languages.) The presence of the theme vowel /u-/ should be noted in the causative verbs, and in some cases is the only difference between the two verbs. One example of a double causative is also included here; these are not possible in all varieties. Verbs in Zapotec languages inflect with prefixes to show grammatical aspect. The three aspects that are found in all varieties are habitual, potential and completive. San Lucas Quiaviní Zapotec has seven aspects: habitual, perfective, irrealis (viz., potential), progressive, definite (viz., completive), subjunctive, and neutral. The shape of the root affects the way in which verbs conjugate. Consonant-initial roots conjugate differently than vowel-initial roots, for example, and causative verbs conjugate differently than simple verbs. Prefix vowels may be lost or merged with the root vowel, epenthetic vowels and consonants may be found, and root vowels may be affected. The following example shows the aspectual inflection of three verbs in Mitla Zapotec. The only clear morphology in most varieties of Zapotec is the derivational prefix /ʂ-/ (or its cognate) that derives an inherently possessed noun from a noun that does not take a possessor. Compare Mitla Zapotec /koʰb/ 'dough', /ʃ-koʰb/ 'dough of'. The derived noun is used when the possessor is indicated, as in /ʃkoʰb ni/ 'his/her dough'. Franciscan and/or Dominican friars published a vocabulary and grammar of Zapotec in the 16th century [Córdova 1578a, 1578b]. In the past century there have been ongoing efforts to produce Zapotec alphabets and to write in Zapotec. The Isthmus Zapotec alphabet in use today was founded in the 1950s, drawing from works going back as far as the 1920s. Until recently the Zapotec language were only sparsely studied and documented but in recent years Zapotec language has begun to receive serious attention by descriptive linguists (see bibliography). The viability of Zapotec languages also varies tremendously. Loxicha Zapotec, for example, has over 70,000 speakers. San Felipe Tejalapan Zapotec might have ten, all elderly. San Agustín Mixtepec Zapotec reportedly has just one remaining speaker. Historically, government teachers discouraged the use of the language, which has contributed to its diminution in many places. In La Ventosa, Oaxaca, a Zapotec mother of three claims that her children are punished in class if they speak Zapotec. Other areas however, such as the Isthmus, proudly maintain their mother tongue. Zapotec-language programming is available on a number of radio stations: The CDI's radio stations XEGLO, based in Guelatao de Juárez, Oaxaca, and XEQIN-AM, based in San Quintín, Baja California, carry Zapotec-language programming along with other indigenous languages. (Coatecas Altas Zapotec speakers live in the area around San Quintín, Baja California.) in the Isthmus there is one privately owned commercial station, Radio TEKA (1030 AM), and several community-based radio stations, most notably the community-based Radio Totopo (102.5 FM) in Juchitán, Oaxaca, and Radio Atempa in San Blas Atempa. In California, Los Angeles is home to communities of Yalálag Zapotec and Zoogocho Zapotec language speakers. In 2010, a Zapotec language class was offered at the University of California in San Diego. In 2012, the Natividad Medical Center of Salinas, California, had trained medical interpreters bilingual in Zapotec languages as well as in Spanish; in March 2014, Natividad Medical Foundation launched Indigenous Interpreting+, "a community and medical interpreting business specializing in indigenous languages from Mexico and Central and South America," including Zapotec languages, Mixtec, Trique, and Chatino. ^ Nordhoff, Sebastian; Hammarström, Harald; Forkel, Robert; Haspelmath, Martin, eds. (2013). "Zapotec". Glottolog 2.2. Leipzig: Max Planck Institute for Evolutionary Anthropology. ^ See Marlett (2009) for data from various dialects presented in a single table. ^ See Egland et al. (1983:66-81) for a report of the results of mutual intelligibility testing that was carried out in many communities comparing one variety with another. No other study of this kind has been done in the Zapotec area. It is the primary basis on which the Ethnologue listings are based. ^ Fernández de Miranda 1995. ^ Speck 1978:32, simplifying somewhat. ^ The stem loses the aspiration feature in this form. ^ Martínez & Marlett (2008). ^ Stubblefield & Stubblefield (1991:198). ^ Pickett, Velma. "Isthmus Zapotec (zai)". Summer Institute of Linguistics in Mexico. Retrieved 2014-03-13. ^ Almanzan, Krista (2014-03-27). "Indigenous Interpreting Program Aims to be Far Reaching". 90.3 KAZU. Retrieved 2014-04-06. ^ "Coatecas Altas Zapotec (zca)". Summer Institute of Linguistics in Mexico. Retrieved 2014-03-11. ^ Tintocalis, Ana (2010-09-01). "Rise In Zapotec-Speaking People Results In New SDSU Language Course". KPBS San Diego Public Radio & TV: News, Arts & Culture. Retrieved 2014-03-09. ^ Melissa Flores (2012-01-23). "Salinas hospital to train indigenous-language interpreters". HealthyCal.org. Retrieved 2012-08-05. ^ "Natividad Medical Foundation Announces Indigenous Interpreting+ Community and Medical Interpreting Business". Market Wired. 2014-03-07. Retrieved 2014-03-13. Beam de Azcona, Rosemary G. 2004. A Coatlán-Loxicha Zapotec Grammar. Ph.D. dissertation. University of California, Berkeley. Black, Cheryl A. 2000. Quiegolani Zapotec Syntax: A Principles and Parameters Account. SIL International and University of Texas at Arlington. Broadwell, George A. 2001. Optimal order and pied-piping in San Dionicio Zapotec. in Peter Sells, ed. Formal and Empirical Issues in Optimality Theoretic Syntax, pp. 197–123. Stanford: CSLI Publications. Egland, Steven; Doris Bartholomew; and Saul Cruz Ramos. 1983 . La inteligibilidad interdialectal en México: Resultados de algunos sondeos. Mexico City: Instituto Lingüístico de Verano. Fernández de Miranda, María Teresa. 1995. El protozapoteco. Edited by Michael J. Piper and Doris A. Bartholomew. Mexico City: El Colegio de México and Instituto Nacional de Antropología e Historia. Marlett, Stephen A., compiler. 2009. Basic vocabulary. In Cheryl A. Black, H. Andrew Black and Stephen A. Marlett (eds.) The Zapotec grammar files. Martínez, Valerie and Stephen A. Marlett. 2008. Nouns. In Cheryl A. Black, H. Andrew Black and Stephen A. Marlett (eds.) The Zapotec grammar files. Munro, Pamela, and Felipe H. Lopez, with Olivia V. Méndez [Martínez], Rodrigo Garcia, and Michael R. Galant. 1999. Di'csyonaary X:tèe'n Dìi'zh Sah Sann Lu'uc (San Lucas Quiaviní Zapotec Dictionary / Diccionario Zapoteco de San Lucas Quiaviní). Los Angeles: (UCLA) Chicano Studies Research Center Publications. Stubblefield, Morris and Carol Stubblefield. 1991. Diccionario Zapoteco de Mitla. Instituto Lingüístico de Verano, Mexico. Alleman, Vera Mae, compiler. 1952. Vocabulario zapoteco del Rincón. Mexico City: Instituto Lingüístico de Verano. Bartholomew, Doris A. 1983. Grammatica Zapoteca, in Neil Nellis and Jane Goodner Nellis Diccionario Zapoteco de Juarez Instituto Lingüístico de Verano. Mexico. Briggs, Elinor. 1961. Mitla Zapotec grammar. Mexico City: Instituto Lingüístico de Verano and Centro de Investigaciones Antropológicas de México. Butler, Inez M. 1980. Gramática zapoteca: Zapoteco de Yatzachi el Bajo. Gramáticas de Lenguas Indígenas de México, 4. Mexico: Instituto Lingüístico de Verano. Butler, Inez M., compiler. 1997. Diccionario Zapoteco de Yatzachi: Yatzachi el bajo, Yatzachi el alto, Oaxaca. Serie de vocabularios y diccionarios indígenas "Mariano Silva y Aceves", 37. Tucson, AZ: Instituto Lingüístico de Verano. Córdova, Fr. Juan de. 1886 [1578a]. Arte del idioma zapoteco. Morelia: Imprenta del Gobierno. Córdova, Fr. Juan de. 1987 [1578b]. Vocabulario en lengua çapoteca. México: Ediciones Toledo (INAH). Junta Colombina de México. 1893. Vocabulario castellano - zapotec. Mexico City : Oficina Tipográfica de la Secretaría de Fomento. Long C., Rebecca & Sofronio Cruz M., compilers. 1999. Diccionario Zapoteco de San Bartolomé Zoogocho Oaxaca. Coyoacán D.F. : Instituto Lingüístico de Verano. López, Filemón & Ronaldo Newberg Y. 2005. La conjugación del verbo zapoteco: zapoteco de Yalálag. 2nd ed. Instituto Lingüístico de Verano. Méndez S., Pedro, compiler, & others. 2004. Diccionario zapoteco; Zapoteco de San Pablo Yaganiza, Oaxaca. Mexico City: Instituto Lingüístico de Verano. Nellis, Neil and Jane Goodner Nellis. 1983. Diccionario Zapoteco de Juarez. Instituto Lingüístico de Verano. Mexico. Pickett, Velma B. and others. 1959. Vocabulario zapoteco del Istmo : Castellano zapoteco, zapoteco-castellano. Serie de vocabularios indígenas "Mariano Silva y Aceves", 3. Mexico: Instituto Lingüístico de Verano. [2nd ed., revised and enlarged (1965); republished (1968, 1971)]. Fifth edition (2007) available on-line. Pickett, Velma B., Cheryl A. Black and Vicente Marcial C. 2001. Gramática Popular del Zapoteco del Istmo. 2nd edition. Instituto Lingüístico de Verano; Tucson, Arizona. Ruegsegger, Manis & Jane Ruegsegger. 1955. Vocabulario zapoteco del dialecto de Miahuatlán del Estado de Oaxaca. Mexico City: Instituto Lingüístico de Verano. Sonnenschein, Aaron Huey. 2005. A descriptive grammar of San Bartolomé Zoogocho Zapotec. Munich: Lincom Europa. Arellanes, Francisco. 2009. El sistema fonológico y las propriedades fonéticas del zapoteco de San Pablo Güilá. Descripción y análisis formal. Tesis doctoral. Colegio de México. Avelino, Heriberto. 2004. Topics in Yalálag Zapotec, with particular reference to its phonetic structures. UCLA Ph.D. dissertation. Chávez-Peón, Mario. 2010. Ph.D. thesis. University of British Columbia. Esposito, Christina M. 2002. Santa Ana del Valle Zapotec Phonation. M.A. thesis, UCLA. Foreman, John. 2006. The Morphosyntax of Subjects in Macuiltianguis Zapotec. Ph.D. Dissertation, UCLA. Galant, Michael R. 1998. Comparative Constructions in Spanish and San Lucas Quiaviní Zapotec. Ph.D. Dissertation, UCLA. Gibbs, William P. 1977. Discourse elements in Sierra de Juarez Zapotec. M.A. thesis. University of Texas at Arlington. Heise, Jennifer Lynn. 2003. Participant reference and tracking in San Francisco Ozolotepec Zapotec. M.A. thesis. Graduate Institute of Applied Linguistics. Jensen de López, Kristine M. 2002. Baskets and Body-Parts. Ph.D. dissertation, Aarhus University. Lee, Felicia A. 1999. Antisymmetry and the Syntax of San Lucas Quiaviní Zapotec. Ph.D. dissertation, UCLA. Lillehaugen, Brook Danielle. 2003. The Categorial Status of Body Part Prepositions in Valley Zapotec. M.A. thesis, UCLA. Lillehaugen, Brook Danielle. 2006. Expressing Location in Tlacolula Valley Zapotec. Ph.D. dissertation, UCLA. López Cruz, Ausencia. 1997. Morfología verbal del zapoteco de San Pablo Güilá. Tesis de licenciatura, ENAH. MacLaury, Robert E. 1970. Ayoquesco Zapotec: Ethnography, phonology, and lexicon. MA thesis, University of the Americas. Méndez [Martínez], Olivia V. 2000. Code-Switching and the Matrix Language Model in San Lucas Quiaviní Zapotec. M.A. thesis, UCLA. Pickett, Velma B. 1959. The grammatical hierarchy of Isthmus Zapotec. Ph.D. dissertation, University of Michigan. Reeck, Roger. 1991. A trilingual dictionary in Zapotec, English and Spanish. MA thesis, Universidad de las Américas-Puebla. Riggs, David B. 1991. A comparative grammar of English for Zapotec speakers (Gramática comparativa inglés-zapoteco). M.A. thesis. Universidad de las Américas. Sicoli, Mark A. 1999. A comparison of Spanish loanwords in two Zapotec languages: Contact-induced language change in Lachixío and Juchitán Zapotec. University of Pittsburgh, M.A. Thesis. Sicoli, Mark A. 2007. Tono: A linguistic ethnography of tone and voice in a Zapotec region. University of Michigan, Ph.D. Dissertation. Sonnenschein, Aaron Huey. 2004. A Descriptive Grammar of Zoogocho Zapotec on a Typological Basis. University of Southern California Ph.D. dissertation. de Feria, Pedro. 1567. Doctrina Christiana en lengua castellana y zapoteca. Galant, Michael René. 2006. Comparative Constructions in Spanish and San Lucas Quiavini Zapotec (LINCOM Studies in Language Typology 15). Lincom Europa: München. Jiménez Girón, Eustaquio. 1980. Guía gráfico-fonémica para la escritura y lectura del zapoteco. Juchitán, Oaxaca: Vitoria Yan. Jiménez Jiménez, Enedino & Vicente Marcial Cerqueda. 1997. Neza diidxa': ni gacané binnihuaniisi gu'nda', gucaa ne güi' diidxazá (Vocabulario zapoteco: auxiliar del modelo pedagógico de diálogo cultural y alfabetización). Juchitán, Oaxaca: Centro de Investigación y Desarrollo Binnizá. Liga Bíblica, La [Jones, Ted, et al.]. 1995. Xtiidx Dios Cun Ditsa (El Nuevo Testamento en el zapoteco de San Juan Guelavía y en español). Munro, Pamela, Brook Danielle Lillehaugen and Felipe H. Lopez. In preparation. Cali Chiu? A Course in Valley Zapotec. ms.: UCLA / UNAM. Butler, Inez M. 1982. Un relato de la hechicería en los pueblos zapotecos de la sierra en el distrito de Villa Alta. Tlalocan 9: 249-55. Nellis, Donald G. 1979. The old woman and the town authorities: Cajonos Zapotec. In: Linda K. Jones (ed.) Discourse studies in Mesoamerican languages 2: Texts, 181-208. Dallas: Summer Institute of Linguistics and the University of Texas at Arlington. Olson, Donald. 1970. The earthquake in Ocotlán: Three texts in Zapotec. Tlalocan 6: 229-39. Persons, David. 1979. Rabbit, coyote, and skunk; When people die: Lachixio Zapotec. In: Linda K. Jones (ed.) Discourse studies in Mesoamerican languages 2: Texts, 211-23. Dallas: Summer Institute of Linguistics and the University of Texas at Arlington. Rendón, Juan José. 1995. El tlacuache y el coyote en zapoteco. In: Juan José Rendón (ed.) Diversificación de las lenguas zapotecas. Mexico City: Instituto Oaxaqueño de las Culturas, Centro de Investigaciones y Estudios Superiores de Antropología Social. Speck, Charles H., compiler. 1998. Zapotec oral literature; El folklore de San Lorenzo Texmelucan. Dallas: Summer Institute of Linguistics. Stubblefield, Morris & Carol Stubblefield. 1969. The story of Läy and Gisaj: a Zapotec sun and moon myth. Tlalocan 6: 46-62. Stubblefield, Morris & Carol Stubblefield, compilers. 1994. Mitla Zapotec texts. Dallas: Summer Institute of Linguistics. Bickmore, Lee S. and George A. Broadwell. 1998. High tone docking in Sierra Juárez Zapotec. International Journal of American Linguistics, 64:37-67. Jones, Ted E., and Lyle M. Knudson. 1977. "Guelavía Zapotec Phonemes". Studies in Otomanguean Phonology, ed., William R. Merrifield, pp. 163–80. [Dallas/Arlington]: SIL / University of Texas, Arlington. Marlett, Stephen A. 1987. The syllable structure and aspect morphology of Isthmus Zapotec. International Journal of American Linguistics 53: 398-422. Merrill, Elizabeth D. 2008. Tilquiapan Zapotec. Journal of the International Phonetic Association 38(1): 107-114. Pickett, Velma B., María Villalobos Villalobos, and Stephen A. Marlett. 2008. Zapoteco del Istmo (Juchitán). Ilustraciones fonéticas de lenguas amerindias, ed. Stephen A. Marlett. Lima: SIL International y Universidad Ricardo Palma. Rendón, Juan José. 1970. Notas fonológicas del Zapotec de Tlacochahuaya. Anales de Antropología, vol. 7. Mexico City: UNAM. Sicoli, Mark A. 2000. "Loanwords and contact-induced phonological change in Lachixío Zapotec." Proceedings of the 25th annual meeting of the Berkeley Linguistics Society. Berkeley: Berkeley Linguistic Society. Ward, Michael, Emiliano Zurita Sánchez, and Stephen A. Marlett. 2008. Zapoteco de Santa Catarina Quioquitani. Ilustraciones fonéticas de lenguas amerindias, ed. Stephen A. Marlett. Lima: SIL International y Universidad Ricardo Palma. Black, Cheryl A.; H. Andrew Black; and Stephen A. Marlett (eds.) The Zapotec Grammar Files. Broadwell, George A. 2001. "Optimal order and pied-piping in San Dionicio Zapotec." In Peter Sells, ed. Formal and Empirical Issues in Optimality Theoretic Syntax, pp. 197–123. Stanford: CSLI Publications. Broadwell, George A. 2005. The morphology of Zapotec pronominal clitics.in Rosemary Beam de Azcona and Mary Paster, eds. Survey of California and Other Indian Languages, Report 13: Conference on Otomanguean and Oaxacan Languages, pp. 15–35. University of California at Berkeley. Butler, Inez M. 1976. "Reflexive constructions of Yatzachi Zapotec." International Journal of American Linguistics 42: 331-37. Butler, Inez M. 1976. "Verb classification of Yatzachi Zapotec." SIL Mexico Workpapers 2: 74-84. Earl, Robert. 1968. "Rincon Zapotec clauses." International Journal of American Linguistics 34: 269-74. Jones, Ted E., and Ann D. Church. 1985. "Personal pronouns in Guelavía Zapotec". S.I.L.-Mexico Workpapers 7: 1-15. Lee, Felicia A. In press. "On the Absence of Quantificational Determiners in San Lucas Quiaviní Zapotec." To appear in L. Matthewson, (ed.) Quantification: Universals and Variation. Elsevier. Lee, Felicia A. n.d. "Modality and the Structure of Tense in Zapotec." In B. Bruening, (ed. ), Proceedings of SCIL 8. Cambridge: MITWPL. Lee, Felicia A. n.d. "Pseudo-quantification in Possessives." In C. Pye, (ed. ), Proceedings of the Mid-America Linguistics Conference. Lawrence: The University of Kansas. Lee, Felicia A. n.d. "Focus and Judgment Type in San Lucas Quiaviní Zapotec." In M. Juge and J. Moxley, (eds. ), Proceedings of BLS 23. Berkeley: Berkeley Linguistic Society. Lee, Felicia A. n.d. "The Predicational Nature of Clefts: Evidence from Zapotec." In K. Singer, R. Eggert, and G. Anderson, (eds. ), Proceedings of CLS 33. Chicago: The Chicago Linguistic Society. Lee, Felicia A. n.d. "Three Question Markers in San Lucas Quiaviní Zapotec." To appear in Anthropological Linguistics. Lee, Felicia A. 1995. "Aspect, Negation, and Temporal Polarity in Zapotec." In B. Agbayani and S.-W. Tang, (eds. ), Proceedings of WCCFL 15. Stanford: CSLI. Lee, Felicia A. 1996. "Focus in the Future and the Thetic/Categorical Distinction." In V. Samiian, (ed. ), Proceedings of WECOL 96. Fresno: California State University, Fresno. Lee, Felicia A. 1997. "Evidence for Tense in a 'Tenseless' Language." In P. Tamagi, M. Hirotani, and N. Hall, (eds. ), Proceedings of NELS 29. Amherst: GLSA. Lee, Felicia A. 2000. "VP Remnant Movement and VSO in Quiaviní Zapotec." In A. Carnie and E. Guilfoyle (editors), The Syntax of Verb Initial Languages, Oxford: Oxford University Press. Lee, Felicia A. 2000. "Relative Clauses Without Wh-Movement." In M. Kim and U. Strauss, (eds. ), Proceedings of NELS 31. Amherst: GLSA. Lee, Felicia A. 2001. "WH and Focus Are Not the Same Projection." In K. Megerdoomian and L. Bar-El, (eds. ), Proceedings of WCCFL 20. Somerville: Cascadilla Press. Lee, Felicia A. 2001. "Anaphoric R-Expressions: Bound Names as Bound Variables." In M. Hirotani, (ed. ), Proceedings of NELS 32. Amherst: GLSA. Lee, Felicia A. 2002 "Anaphoric R-Expressions as Bound Variables." Proceedings of BLS 28. Lee, Felicia A. 2003. "Anaphoric R-Expressions as Bound Variables." Syntax. 6, 1: 84-114. Blackwell Publishing. Lee, Felicia A. 2005. "Clause-Fronting and Clause-Typing in San Lucas Quiaviní Zapotec." In Andrew Carnie, Heidi Harley, Sheila Dooley Collberg (eds) Verb First, John Benjamins Publishers, Philadelphia/Amsterdam. Lee, Felicia A. 2006. Remnant Raising and VSO Clausal Architecture: A Case Study from San Lucas Quiaviní Zapotec. Springer. Lillehaugen, Brook Danielle. 2003. "The Acquisition of Body Part Prepositions in Valley Zapotec Languages." Proceedings from the First Conference on Indigenous Languages of Latin America, University of Texas, Austin. Lillehaugen, Brook Danielle. 2004. "The Syntactic and Semantic Development of Body Part Prepositions in Valley Zapotec Languages," pp. 69 – 92, Proceedings from the sixth Workshop on American Indigenous Languages, Santa Barbara Papers in Linguistics, vol. 14, Jeanie Castillo (ed.). Munro, Pamela. 2002. "Hierarchical Pronouns in Discourse: Third Person Pronouns in San Lucas Quiaviní Zapotec Narratives". Southwest Journal of Linguistics 21: 37-66. Lyman, Larry. 1964. The verb syntagmemes of Choapan Zapotec. Linguistics 7: 16-41. Marlett, Stephen A. 1993. Zapotec pronoun classification. International Journal of American Linguistics 59: 82-101. Marlett, Stephen A. & Velma B. Pickett. 1996. El pronombre inaudible en el zapoteco del Istmo. In Zarina Estrada Fernández, Max Figueroa Esteva & Gerardo López Cruz (eds.) III Encuentro de Lingüística en el Noroeste, 119-150. Hermosillo, Sonora: Editorial Unison. Operstein, Natalie. 2002. "Positional Verbs and Relational Nouns in Zaniza Zapotec," pp. 60–70. Proceedings from the fourth Workshop on American Indigenous Languages, Santa Barbara Papers in Linguistics, vol 11. Rojas, Rosa Maria. to appear. "La predicación secundaria en el zapoteco de Santa Ana del Valle, Oax." por aparecer en Memorias del Primer Coloquio "Leonardo Manrique", México: INAH. Rojas, Rosa Maria. 2001. "La formación de palabras desde el punto de vista del contenido en lenguas zapotecas: la modificación y el desarrollo" en Dimensión Antropológica, vol. 21, 2001. Speck, Charles H. 1994. The existential use of positional verbs in Texmelucan Zapotec. Work Papers of the Summer Institute of Linguistics, University of North Dakota Session 38: 75-86. Speck, Charles H. & Velma B. Pickett. 1976. Some properties of the Texmelucan Zapotec verbs go, come, and arrive. International Journal of American Linguistics 42: 58-64. Benton, Joseph P. 1987. Clause and sentence-level word order and discourse strategy in Chichicapan Zapotec oral narrative discourse. SIL Mexico Workpapers 9: 72-84. Benton, Joseph P. 1997. Aspect shift in Chichicapan Zapotec narrative discourse. SIL Mexico Workpapers 12: 34-46. Hopkins, Mary L. 1995. "Narrative peak in Xanaguía Zapotec." SIL Mexico Workpapers 11: 17-36. Kreikebaum, Wolfram. 1987. Fronting and related features in Santo Domingo Albarradas Zapotec. SIL Mexico Workpapers 9: 33-71. Long, Rebecca. 1985. Topicalization in Zoogocho Zapotec expository discourse. SIL Mexico Workpapers 7: 61-100. Lyman, Rosemary. 1977. Participant identification in Choapan Zapotec. Work Papers of the Summer Institute of Linguistics, University of North Dakota 21: 115-31. (de) Martinez, Valerie. 1995. Who’s who in Quiatoni Zapotec narratives. SIL Mexico Workpapers 11: 37-46. Newberg, Ronald. 1987. Participant accessibility in Yalálag Zapotec. SIL Mexico Workpapers 9: 12-25. Olive, Julie Nan. 1995. Speech verbs in Xanaguía Zapotec narrative. SIL Mexico Workpapers 11: 47-52. Piper, Michael J. 1995. The functions of ‘lëë’ in Xanica Zapotec narrative discourse with some implications for comparative Zapotec. SIL Mexico Workpapers 11: 67-78. Riggs, David B. 1987. Paragraph analysis for Amatlán Zapotec. SIL Mexico Workpapers 9: 1-11. Sicoli, Mark A. 2010. Shifting voices with participant roles: Voice qualities and speech registers in Mesoamerica. Language in Society 39(4). Thiessen, Grace. 1987. The functions of the clitic -ha in Western Ixtlán Zapotec. SIL Mexico Workpapers 9: 85-100. Ward, Michael. 1987. A focus particle in Quioquitani Zapotec. SIL Mexico Workpapers 9: 26-32. Broadwell, George A. 2005. Zapotecan languages. Encyclopedia of Language and Linguistics, 2nd edition. Elsevier. Butler, Inez M. 1985. "Event prominence in Zoogocho Zapotec narrative discourse." SIL Mexico Workpapers 7: 16-60. Lopez, Felipe H., and Pamela Munro. 1998. The United Nations' Universal Declaration of Human Rights translated into San Lucas Quiaviní Zapotec. Lopez, Felipe H., and Pamela Munro. 1999. "Zapotec Immigration: The San Lucas Quiaviní Experience". Aztlan. 24, 1: 129-149. Munro, Pamela. 1996. "Making a Zapotec Dictionary". Dictionaries 17: 131-55. Munro, Pamela. 2003. Preserving the Language of the Valley Zapotecs: The Orthography Question. Presented at Language and Immigration in France and the United States: Sociolinguistic Perspectives. University of Texas. Nellis, Jane G. 1947. Sierra Zapotec forms of address, International Journal of American Linguistics 13: 231-32. Persons, Jan A. 1997. High pitch as a mark of respect in Lachixío Zapotec. Work Papers of the Summer Institute of Linguistics, University of North Dakota 41: 59-60. Robinson, Dow F. 1963. Field notes on Coatlán Zapotec. Hartford, CN: Hartford Seminary Foundation.